Welcome to MasPro Service! 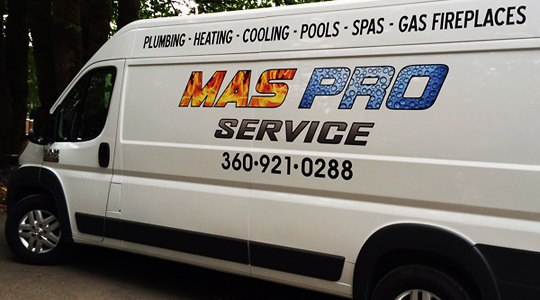 We provide Plumbing Repair, Drain Cleaning, and Water Heater Service in Vancouver, WA. With more than 25 years of experience, MasPro Service provides prompt and efficient work. When you make an appointment with us, our staff will offer you personalized service, and our goal is to get your plumbing work completed correctly the first time. Among other repairs, we can fix faucets, water lines, and sump pumps. We also install water heaters, and we can assist you in choosing a system that works for your property. Our locally owned and operated business in Battle Ground, WA also offers repairs of pool motors and HVAC systems. Whatever the scope of the job, our technicians will approach it in a detail-oriented fashion. Our goal is to make sure our work lasts, so we use quality products, and we’ll provide you with a satisfaction guarantee. Our owner is always on site, and we can swiftly provide responses to all of your questions. Service areas in Clark County include Vancouver, Battle Ground, Yacolt, Brush Prairie, Woodland, Amboy, Camas, Washougal, Ridgefield, and La Center. We are located in Battle Ground, WA.